The icebreaker Krasin is the only surviving Russian ship that was involved in the Great Patriotic War of 1941-1945. In fact, there are only a few ships dating back to the WWII period left in the world. How many floating icebreaker museums does Russia have, and what's so interesting about the Krasin? The Krasin, which was launched in 1916, has an extremely rich history, and we'll start celebrating its centennial next year. However, the ship's flag was raised on March 31, 1917, so the main festivities are scheduled for 1917. We are working hard to prepare for them. The Krasin is not the only such museum. The Angara floating icebreaker museum is located in Irkutsk. Just like the Krasin, the Angara was built in Newcastle upon Tyne in England. In fact, the older and much smaller Angara was completed a bit earlier. The Lenin floating icebreaker museum in Murmansk is another absolutely unique marvel of world history. It was the first nuclear icebreaker in history, built here in St. Petersburg, formerly called Leningrad, and launched at the Admiralty Shipyard on the opposite bank. Currently, this icebreaker is affiliated with Atomflot and has the status of a departmental museum. Many tourists visit it every year. Actually, we provide a more or less detailed insight into the history of Arctic exploration. Does this mean that the Krasin is the most famous museum in this category? It seems so. The Krasin is the most famous and most legendary icebreaker because highly important events of world history are linked with it. What is the main draw for visitors? First of all, visitors are quite happy to come aboard this ship because they can walk on its deck, enter various compartments, see the wheelhouse, the cabins of the captain and the expedition chief, the mess room and the crew bunks. We offer a separate guided tour of the engine room. Many people are surprised to learn that the Krasin is a steamship with boilers and a steam engine that are completely intact. It appears that the ship has one of the largest steam engines in the world. This remarkable engineering masterpiece with a rated capacity of 3,500 h. p. is probably unique in itself. The Krasin was involved in various legendary events in the Arctic linked with rebuilding our state and key episodes in the history of Arctic exploration. Symbolically, the icebreaker was completed in 1917 and sailed on its last, albeit unsuccessful, mission in 1991. Therefore, its service life reflects the entire Soviet-era Arctic exploration period. Christened the Sviatogor, the ship reached Arkhangelsk in 1917 and took part in the Russian revolution and the civil war. It may be strange, but the Bolsheviks scuttled the ship in the mouth of the Dvina River, so as to prevent Entente Cordiale forces from landing in Arkhangelsk. But the ship's deck and superstructure remained above water. When the British arrived, they pumped all the water from the hull, salvaged the ship and operated it until 1921. The ship even sailed under its original name, HMS Sviatogor. This can be explained by the fact that Emperor Nicholas II signed an order on building the icebreaker. When the revolution began, the imperial government had paid only 70% of the construction costs. Therefore, the icebreaker was requisitioned by British authorities. By the way, we organized a guided tour for Princess Anne, the daughter of Queen Elizabeth II, last year, and, of course, we are very proud of that. How did the icebreaker return home? Soviet trade delegate and diplomat Leonid Krasin (1870-1926) negotiated the signing of a commercial agreement with Britain in order to break the economic blockade imposed on the young Soviet state. The agreement was signed, the Soviet side paid the remaining 30%, and the icebreaker sailed back to Soviet Russia. In reality, Britain was quite happy to get rid of this ship because the waters around the British Isles never freeze and because of sky-high maintenance costs. The ship was renamed the Krasin in 1927 after Mr. Krasin's death. So, that was how the first stage of the ship's history ended. But the Krasin and its crew experienced their finest hour in 1928, when they helped rescue the expedition of General Umberto Nobile (1885-1978), who flew to the North Pole together with his teammates aboard the airship Italia. In 1926, Nobile, a famous Italian airship designer, built the airship Norge and flew it to Alaska together with Norwegian polar explorer Roald Amundsen (1872-1928) via the North Pole. Although the expedition was successful, the great men had a serious disagreement and went their separate ways afterwards. 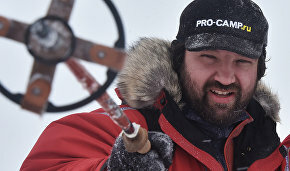 Nobile then decided to organize his own expedition to the North Pole, planning several flights to the vicinity and various research projects. The expedition set out in 1928. Only one mission proved successful, with the Italia reaching the Franz Josef Land and Severnaya Zemlya archipelagos. On its second mission, the airship reached the North Pole but could not land there because of strong winds. On its way back, the Italia encountered head winds and started losing altitude. The airship, including its propellers, apparently became covered with ice. Pieces of ice shooting off from the propellers pierced the Italia's skin. The airship was quickly descending; its car hit a tussock. The Italia smashed open, and some of its crew members fell out and found themselves stranded on ice. Still others, trapped aboard the airship, were blown away and disappeared without a trace. Although many of those on ice suffered arm and leg fractures and other injuries, they and other crewmates were much luckier than those who were carried away inside the airship. They recovered some of the airship's provisions, a tent, a radio transceiver and firearms, and set up a camp on an ice floe not far from Svalbard. Although their transceiver was in good working condition, mainland radio operators were unable to pick up the survivors' distress signal for a long time. Soviet radio ham Nikolai Schmidt in the village of Voznesenye-Vokhma, North Dvina Region, was the first to pick up their distress signal. A rescue operation involving almost all European countries was then launched. The rescuers competed with one another. Despite inadequate coordination, this is still considered the largest international rescue operation in the Arctic, involving dozens of ships and aircraft. The Soviet Union also took an active part in this rescue operation and organized several expeditions aboard the Krasin and some other ships. Although many countries tried to save Nobile and his men, it was the Soviet icebreaker that succeeded in doing so. In 1928, the USSR had yet to gain widespread respect abroad, with leading world powers just starting to recognize the state. Therefore, the rescue of Nobile and his expedition members was instrumental in boosting the country's international reputation. After the epic rescue mission, the USSR became wildly popular abroad, with many members of the Krasin crew, including stokers, embarking on a global speaking tour. In effect, this became the first major Soviet PR project. The rescue expedition also had an important humanitarian aspect. While sailing back from Svalbard, the Krasin picked up a distress signal from the German ocean liner Monte Cervantes, which was sinking rapidly after colliding with an iceberg. The Krasin1 rushed to the rescue, with its divers inspecting the liner's damaged hull and patching up the hole. But the liner was still leaking water through a hole on the other side of its hull. This hole was also patched up using metal from the Krasin's engine room deck, and the German ship was towed to Hamburg. Apart from rescuing Nobile's expedition, the Krasin also saved 1,500 people aboard the huge Monte Cervantes. This great achievement thrilled people all over the world. Newspapers carried numerous stories about the Krasin, its officers and Soviet Russia. In 1969, the Soviet-Italian feature film "Red Tent," starring Nikita Mikhalkov, Yury Vizbor, Donatas Banionis, Claudia Cardinale and Sean Connery, was produced. What's interesting is that the two film directors, Mikhail Kalatozov and Franco Cristaldi, had some major disagreements toward the end of their joint work. As a result, they produced two different film versions. The Soviet version is more subtle and runs 30 minutes longer than the Italian film. Alexander Zatsepin wrote the soundtrack for the Soviet version, while Ennio Morricone scored the Italian version. What happened to the icebreaker and its crew after their big moment? After these events, the Krasin circumnavigated the globe twice, in 1934 and 1941. This is quite impressive because far from every ship has sailed around the world even once. In 1934, the Soviet government moved to save the crew of the steamship Chelyuskin from an ice floe. Several options were suggested, including a rescue expedition involving the Krasin. Judging by the memoirs and diaries of the Chelyuskin crew and passengers, they didn't expect to be saved by aircraft. They hoped that the Krasin would arrive and pick them up. However, Soviet pilots were up to the mark and flew everyone to the mainland. Nevertheless, the Krasin sailed out from Leningrad, crossed the Atlantic Ocean, transited the Panama Canal, crossed the Pacific Ocean, reached Alaska and made it to Chukotka. The entire voyage lasted less than two months. By that time, however, the entire Chelyuskin crew and all its passengers had already been rescued. At the end of this epic rescue expedition, the icebreaker escorted freighters in the vicinity and saved the icebound ship Stalingrad. Therefore, the icebreaker also contributed to this rescue operation. The Krasin eventually sailed along the Northern Sea Route and completed its trip around the world. The second circumnavigation was even more interesting. In 1941, Nazi Germany invaded the USSR, and the Great Patriotic War began. After that, Washington asked Moscow to lease the icebreaker to the United States, which wanted to land an expeditionary force in Greenland, where German meteorological stations were already operating. These stations were able to guide aircraft and ships to their targets, and this seriously infringed upon US national interests. The Soviet government agreed, and the Krasin sailed to the United States. The ship's crew was given the red-carpet treatment; President Franklin Delano Roosevelt met with them and signed a $500,000 check for upgrading the icebreaker and fitting it with weapons. The Krasin was placed inside a dry dock, repaired and equipped with hard-hitting weapons. However, the ship did not remain in the United States. It crossed the Atlantic Ocean and reached Britain. This voyage was quite difficult because the ship and its crew faced powerful storms and also encountered a German U-boat. Once in Britain, the ship was fitted with Oerlikon antiaircraft guns, sailed to Iceland and finally reached the USSR together with the PQ-15 Arctic convoy. Arctic convoys delivered weapons and food to the USSR during the war. About 20 to 30 freighters sailed in formation, escorted by warships, from Iceland to the USSR. They tried to steer clear of the Norwegian coast and to hug the polar icecap because Norway was pocked with Luftwaffe bases. Despite these and other precautions, German warplanes and U-boats attacked the Arctic convoys without respite. The PQ-15 was among the most difficult convoys. German reconnaissance planes sighted it, and active attacks were launched. The Germans used torpedo bombers against this convoy for the first time and sank several ships. They also hunted the heavily armed Krasin, which put up tough resistance and remained afloat. Not a single sailor was seriously injured, although the superstructure was riddled with bullets and shell fragments. Its crew was credited with downing two German aircraft. In any event, the convoy reached Murmansk, with the Krasin sailing on to Severodvinsk and along the Northern Sea Route. To date, the Krasin is the only surviving ship that was involved in the battles of the Great Patriotic War. Russia has no similar ships, and very few of them remain all over the world. Therefore, the Krasin is a legendary ship that deserves every attention and respect. Apart from the convoy, the Krasin was involved in another important episode of the Great Patriotic War in the Arctic. In 1942, the German Kriegsmarine (Navy) mounted its operation Wunderland (Wonderland), aiming to disrupt Russia's Arctic lines of communication. The Nazis were motivated by reports that several warships would be relocated from the Soviet Far East to Murmansk. Berlin probably received this information from Japanese intelligence. The Kriegsmarine planned to deploy its heavy cruiser Admiral Scheer and five U-boats in the Kara Sea. When the Admiral Scheer had reached the vicinity, the Krasin was escorting a convoy of freighters from Dikson to the eastern Arctic. Fortunately, the Admiral Scheer never sighted this convoy because it was forced to attack the small icebreaker Alexander Sibiryakov after the latter's captain refused to obey its orders to maintain radio silence. Other ship crews picked up the Sibiryakov's distress signal and learned about the German warship's whereabouts. After that, the Admiral Scheer quickly sank the Soviet icebreaker. By then, everyone knew that a large enemy warship was prowling the Kara Sea. The Krasin led its ship convoy toward pack ice and saved the ships from possible destruction. The German cruiser and the U-boats failed to accomplish their mission and left the Kara Sea. The Krasin eventually escorted a warship convoy through Vilkitsky Strait, and the convoy reached its destination safely. What happened to the Krasin after the war? Its weapons were dismantled after the war, and the ship was upgraded in Wismar, East Germany. Its current superstructure was added. The ship's interiors were also made in Germany in the 1950s. The ship's unique riveted hull made of British steel is just about the only element dating to the 1920s. But the hull is the most important thing for any ship. After the overhaul, the ship returned to the Northern Sea Route and escorted commercial freighters there. Although the ship used boiler oil, rather than coal for fuel, it became obsolete in the 1970s. Its engine power decreased, the hull wore out, and the authorities started thinking about the ship's future. Taking into consideration the ship's combat heroics, they decided not to scrap it. The Krasin therefore avoided the sad fate of its sister ship, the Yermak, the first Russian icebreaker, which was designed, like the Krasin, by Russian Admiral Stepan Makarov (1848-1904). It was suggested that the Krasin be converted into a research ship. The Krasin had three engines and three screws. Two engines were replaced with steam generators. The steam from the boilers entered power generators, and the ship served as a floating power station. The ship moored at drilling rigs on Svalbard and Franz Josef Land and supplied power and steam. 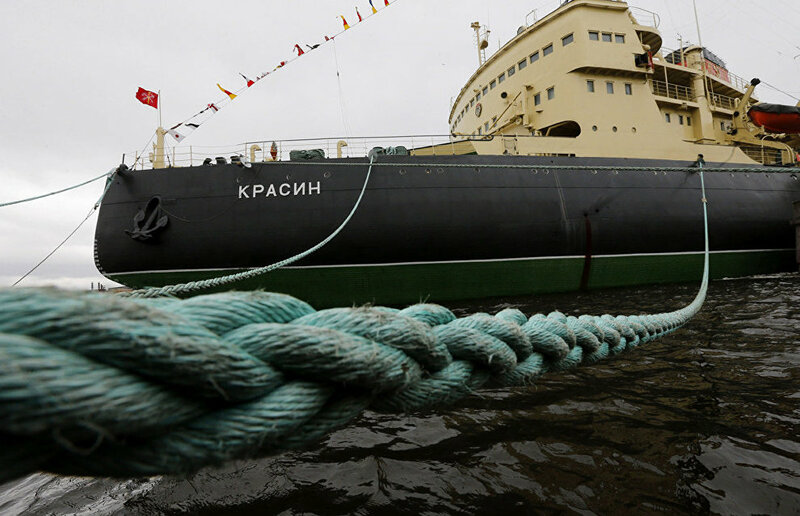 Here we should note modestly that the Krasin has much to do with the discovery of oil and gas on Arctic islands. It was used as a research ship throughout the 1970s and the 1980s. How did the Krasin become a museum? In 1989, the Krasin was handed over to the International Foundation for the History of Science, which planned to turn the ship into a museum. But it was not so simple. The icebreaker arrived in Leningrad, but after the Soviet Union collapsed in 1991, the foundation sold the ship to another organization, which resold it to some other agency. The icebreaker faced bleak prospects. But the Russian public learned about its miserable plight and started protesting. The government was bombarded with letters, and a committee to save the Krasin was established. A government resolution recognizing the Krasin as a federal cultural landmark was signed as a result. This document was used to annul the Krasin sale transaction during courtroom battles over the next two years. 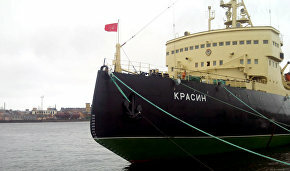 The transaction was declared null and void, and the Krasin remained in St. Petersburg as a floating museum. In the 1990s, the cash-strapped city authorities were unable to maintain the ship. In 2004, it was decided to transfer the ship from St. Petersburg to the World Ocean Museum, affiliated with the Ministry of Culture. Did anything change after the ship was transferred to the Ministry of Culture? The icebreaker is undergoing major renovations and maintenance. 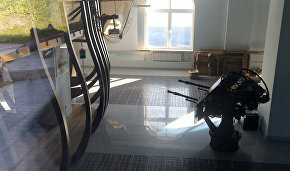 Indeed, the Krasin was not adequately serviced during the entire post-Soviet period, and the World Ocean Museum is the first place to provide such maintenance. We hold numerous conferences and receive quite a few tourists onboard. Please come and visit us, and you'll have a great time. When were the first exhibitions brought aboard the Krasin? The first exhibitions appeared in the 1990s after the icebreaker was opened to visitors. It started functioning as a full-fledged museum in 2004, when we moved to set up and replenish its exhibits. How do ships turn into floating museums, and how many such museums does Russia have? In all, Russia has about 30 floating museums affiliated with the Ministry of Culture and Atomflot and some other departments. Add to them such warships as the cruisers Avrora and Kutuzov, and so on. The World Ocean Museum, which owns an entire vintage ship fleet, plays the lead here. Most ships are located in Kaliningrad, including the research ship Vityaz, the Cosmonaut Viktor Patsayev, the fishing trawler STR-129 and the submarine B-413 with wonderful exhibitions onboard. The World Ocean Museum continues to grow, and it will soon receive the last remaining lighthouse ship, the Irbensky. The Maritime Heritage of Russia Association is strongly advocating a long-term program for converting vintage ships into floating museums. How did all these ships become museums? No one cared about them until their future was jeopardized and the public launched campaigns in defense. The ships slowly rusted away at their berths, and tremendous sums had to be spent on their overhauls. To avoid this, the association suggests that we start thinking about aging operational ships today. It is possible to select their owners in advance and to set up improvised "pension funds." What ships are you talking about? We have several ships that are listed as outstanding structures and science or technological landmarks. The salvage ship Kommuna of the Russian Black Sea Fleet is a classic example. This ship was built in 1914 at the Putilov Plant in St. Petersburg (Petrograd). This absolutely unique masterpiece of Russian engineering is an enormous catamaran (twin-hull) ship measuring over 100 meters long and linked by a system of arches. The Kommuna, which closely resembles a floating Eiffel Tower, is the oldest Russian naval ship that maintains and repairs submarines to this day. Obviously, it will have to be decommissioned soon, and we need to take urgent action in order to preserve it as a floating museum because this exhibit would be quite unique. There are some other examples, including our tall ships. The Sedov and Kruzenshtern are the most famous and oldest tall ships in Russia. Fortunately, they are still afloat. The Sedov has recently circumnavigated the world, but we need to think about their future already, and we should realize that they will eventually become floating museums. When does the Maritime Heritage of Russia Association plan to unveil a ship preservation program? I believe that this program will be finalized this year, and we'll start discussing it in earnest. How many icebreakers can be converted into floating museums? We're now discussing the preservation of the icebreaker Arktika, but this issue is rather complicated. The preservation of such a large ship is a very expensive project, although the Arktika has scored some major achievements. For example, it was the first ship to reach the North Pole. The cost of scrapping this ship is about the same as that of preserving it during the first stage as a museum and exhibition center. But we should also heed the opinion of Rosatomflot, which should continue to own this icebreaker because it is the only company that can service it, due to residual radiation. What does it feel like to work aboard the Krasin? It's very interesting to work here. The ship hosts a lot of events, conferences and exhibitions dealing with the history of the Arctic and Russia's maritime history. 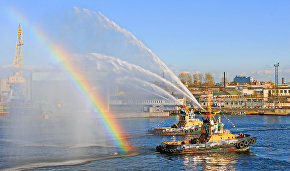 The Krasin has virtually become a center for preserving Russia's maritime heritage. It houses the headquarters of the Maritime Heritage of Russia Association, and I'm very happy to be here.